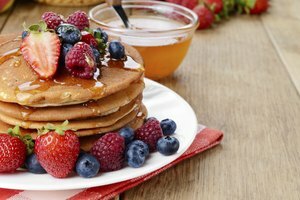 Whether you're making them from scratch or using a ready-made pancake mix, there are a couple tricks you can employ to make sure your flapjacks are always light and airy. All you need is a couple extra ingredients you probably already have stashed in your kitchen. 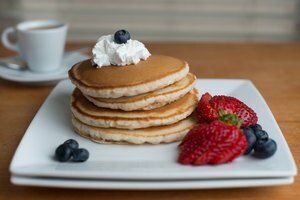 Once you learn these basics of making light and fluffy pancakes, you can apply them to large and small batches alike, and have these tricks at the ready whenever breakfast comes calling. Make the pancake batter according to your recipe or the instructions on the box. 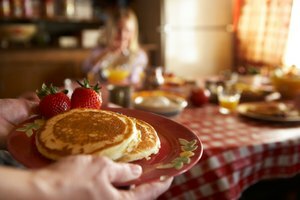 Be careful not to add too much water or milk -- if the batter is runny your pancakes won't be fluffy. The batter should fall in a dollop from the spoon, not drip off of it. Start by adding less liquid than the recipe calls for and add small amounts until the right thickness is achieved. Stir in 1 teaspoon of vanilla extract per batch of pancake batter. The vanilla adds just a hint of extra flavor to the pancakes. Add 1 teaspoon of sugar per batch of batter. This will make the pancakes lighter and fluffier. Let the pancake batter rest after all the ingredients are mixed together. Leave the batter in the bowl untouched for about five minutes. This allows air to build within the batter. This step is essential in making light and fluffy pancakes. Once your batter has rested, do not stir it again. Heat your griddle over medium-low to medium heat. Make sure it's well greased. Your griddle is ready when water "dances" on it. To do this, wet your hand and flick some drops on the griddle. If the water "dances" the griddle is ready. Flip your pancakes once only. When the edges appear to be dry and bubbles form and break open on the surface, it's time to flip. If the cooked side is too brown by then, turn down the heat. Serve the pancakes hot off the griddle. Use a carbonated beverage like soda water or ginger ale instead of the liquid called for in your recipe. The carbonation will make your pancakes fluffy. 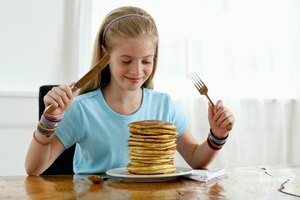 Do not flatten your pancakes with your spatula as they cook, as this will result in hard pancakes.